Now that I am making regular trips to Mass you will see more reviews of Night Shift beer. Love their tap room and it’s a pretty easy stop on my way back from Trillium. If you have recommendations on beer I should try from Night Shift or beer you would like to see reviewed comment here and I will do my best. 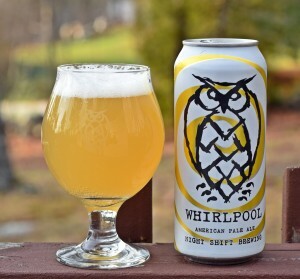 Whirlpool is regularly available in cans that can be purchased at the brewery and occasionally at select retail locations. This beer pours a deep hazy yellow with solid white head that left plenty of lacing. Aroma is full of fruit with some peach, mango and pineapple coming through. Flavor leans heavily towards ripe peach with an extra bit of citrus. Finish is clean with almost no bitterness. Really flavorful for a 4.5% ABV beer and one that I could drink all day long. Everyone that I have shared this beer loved it including many non-craft beer drinkers. Overall just an excellent brew that seems to fly under the radar but that is OK with me as I expect I will be drinking a lot of it in 2016. Brewers Description: Soft pale ale bursting with notes of ripe peach and citrus.